I present my replacement pen Grip Section, for use on the Lamy Safari Rollerball pen. 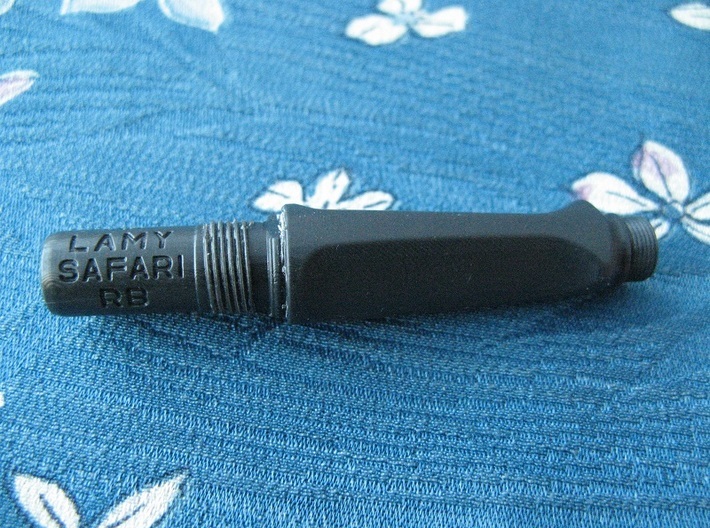 The Lamy Safari is a popular and high quality budget pen, but it's M63 rollerball refill isn't to everyone's taste. 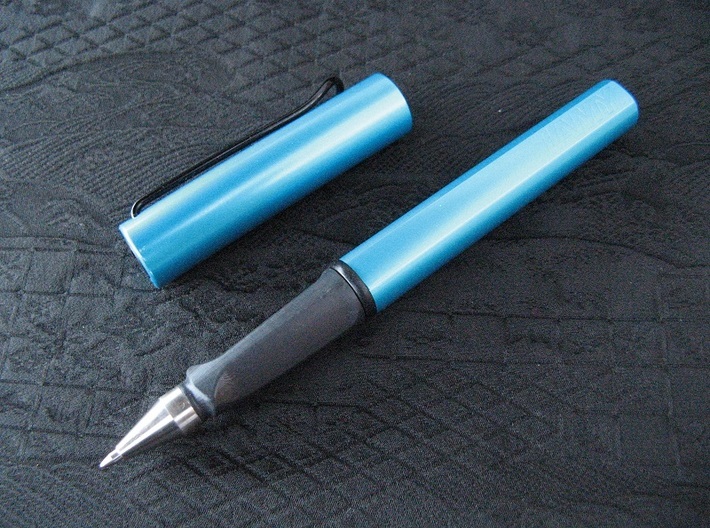 The Uni Signo UMR-1, 5, 7 and 10 refills are considered by many to give one of the finest gel writing experience possible. This replacement part has been designed to allow these Uni refills to be used in the Safari Rollerball pen, without requiring any irreversable modifications. 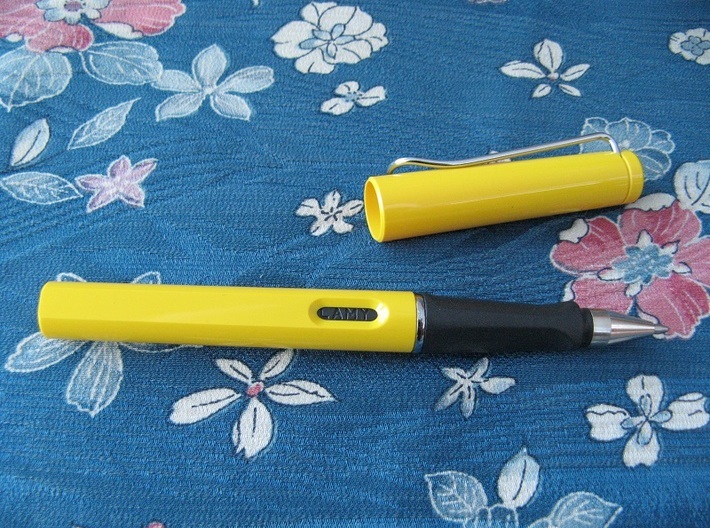 A Uni (uni-ball) Signo UM-151, UM-100 or UM-153 pen. 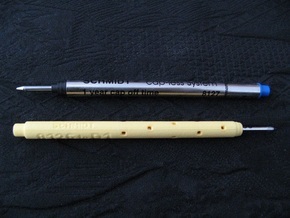 A Uni pen is required, not just the refill, as the pen's metal screw on tip part is required, along with the refill itself. 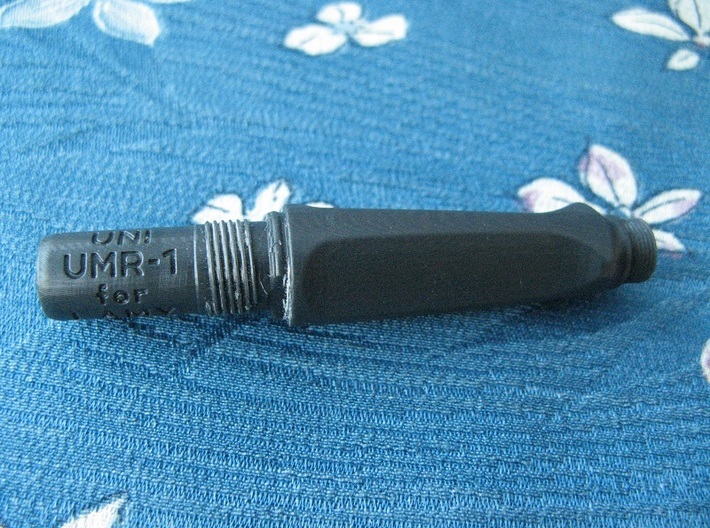 1.0mm (UMR-10) found in the UM-153 pen. 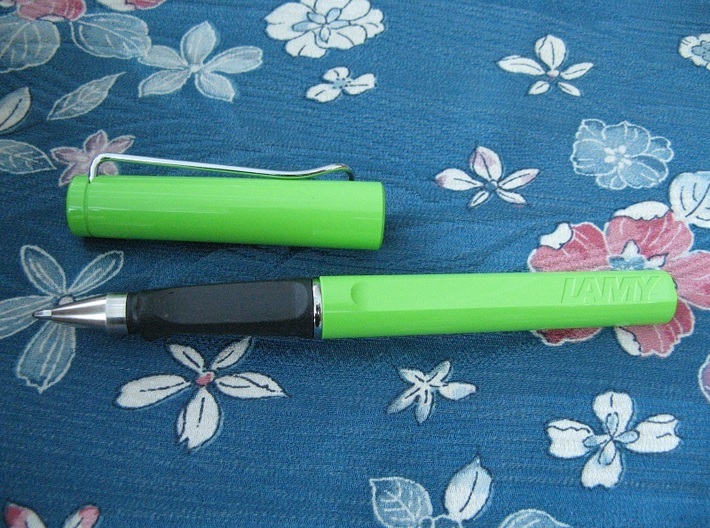 The Lamy Safari Rollerball's original grip section has a black plastic ring clipped into it's base. This part needs to be removed and installed onto the replacement grip section in the same place. 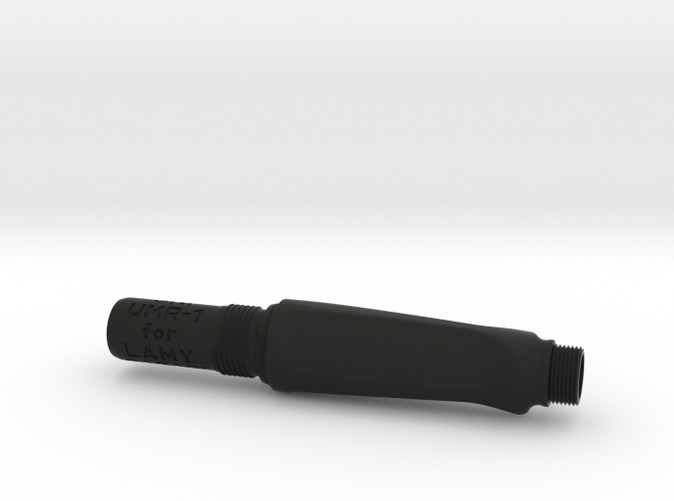 The Tail section of the Lamy pen can then be threaded onto the grip, the refill installed into the top of the grip section and retained by screwing the Uni pen's metal tip part over the refill and onto the grip. 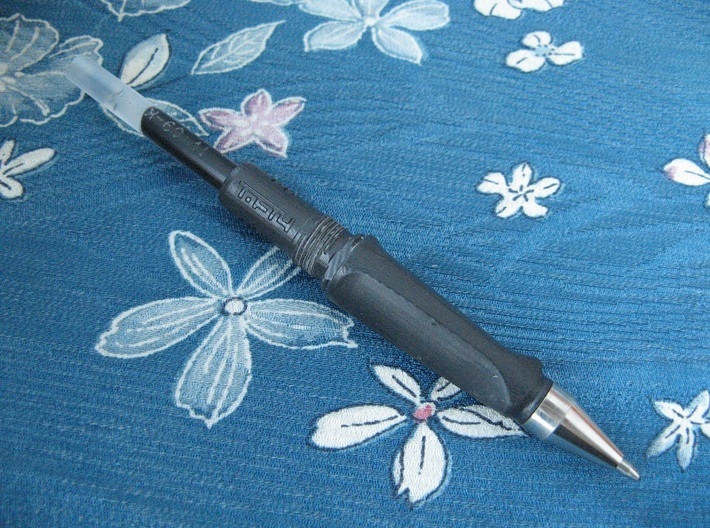 I would suggest printing this item in the Black High Definition Acrylate material, as it is the closest material to the pen's original in terms of appearance and surface finish, although it should be considered less durable. 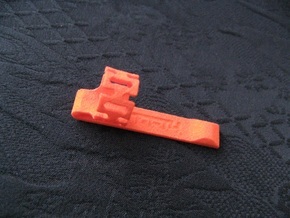 This is the only material that this part can be made available in, as the threads would be too detailed for the other printed plastics. Due to the varying nature of 3D printing, I cannot guarantee that this part will definitely work with the Lamy Safari, although I've made every effort for it to do so. 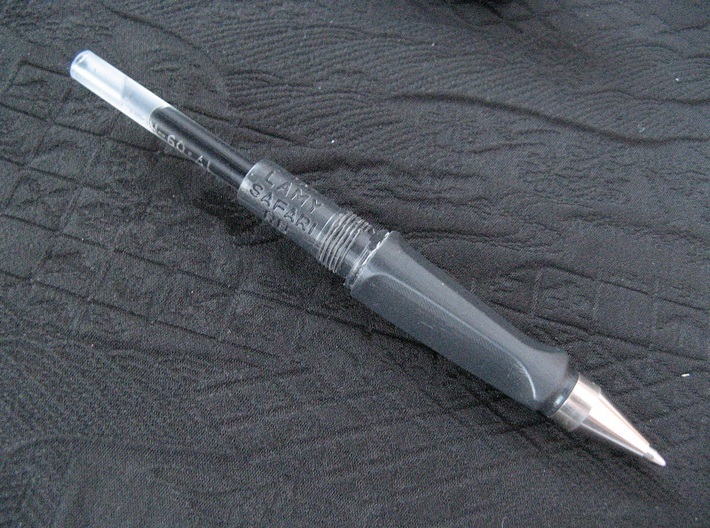 I plan to make as many refill types compatible with as many host pens as possible, so If you have any suggestions on refill adapters or ansilliary parts like this one, please let me know and I can hopefully make it available, depending on the relative sizes involved. I have now created dimensioned drawings of over 80 standard and obscure ballpoint, gel and rollerball refill types, so I like to think that I have a fair idea of what is and isn't possible.